Himachal has been blessed with tremendous natural beauty. The undulating trails of its captivating valleys have always captured the hearts of many trekkers and adventure freaks who come here in search of some unmatched panoramic vistas simultaneously satisfying their adrenaline desires. One of the most magnificent treks in Himachal is the 'Sach Pass' or the 'Sar Pass' trek that takes you through landscapes bustling with gurgling rivers, verdant forests, sparkling streams, quaint little hamlets and striking fruit orchards. One of the oldest trails in Himachal that were used by villagers to cross over from Chamba to snow-bound Pangi Valley and vice-versa in the past, the Sach Pass trek has retained its magical charm even till today. One of the most challenging treks in Himachal, the only thing that keeps you motivated along the treacherous route to the pass is a surreal view of the beautiful clouds, snow-capped peaks of the Pir-Panjal ranges, precariously hanging glaciers and an inner zeal to make it to the summit. While braving the slippery slopes, making your way through tricky terrains and hideous turns with your teeth clattering in the numb chilling cold, when you finally reach your destination perched at a height of 4400 metres above sea level, that proud feeling of being on top of the world is beyond words. The conventional Sach Pass trek commences from Traila in Chamba Valley covering Satrundi via a small village of Bhanodi, further making the way towards Sach Pass following forest trails and snow-laden tracks. 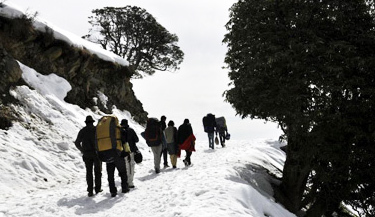 Trek up to the summit perched at an elevation of 14,500 ft., an elevation more than the famed Rohtang Pass. Get the opportunity to camp amidst serene mountain beauty under star-lit sky. Witness unforgettable panoramas of nature teeming with immense picturesque beauty. Get a chance to explore some small and beautiful high-altitude temples hidden in remote villages. The pass is opened from June-July to mid-October but, the best month to visit it, is September. Though in June, chances of sighting the snow are plenty but the roads may be in pathetic conditions. July-August is the time of heavy monsoon in the region with huge possibilities of land-slides and cloud-bursts so, better get on to the journey in September and complete before October, which is the time when temperature drops below zero and not even a single sign of human existence can be spotted in the area. The Sach Pass is tucked away in the Pir-Panjal ranges of Himalayas in the Chamba district of Himachal Pradesh. The pass connects Pangi and Lahaul valleys with the Chamba valley. You can either cease your journey at the Sach Pass or move ahead to venture into the picturesque Pangi Valley, that still remains the remotest corner in Himachal. How to Reach Sach Pass Trek? By Air: Nearest airport is the 'Gaggal' or the 'Dharamsala-Kangra' airport connecting flights from Delhi, Chandigarh and Kullu. From Dharamsala, private taxis, state run buses and private Volvo buses can be booked to reach Chamba and thereon, taxi can be hired up till Traila. By Rail: The nearest railway station is the 'Chakki Bank' station in Pathankot that is connected to various major cities like Delhi and Chandigarh. From the railway station, private taxis, state run buses or private buses can be hired up to Dharamsala or directly to Chamba. Private taxi can thereon be hired up till Traila from where the actual trekking starts. By Road: Volvo buses and Himachal Road Transport Corporation (HRTC) buses regularly ply from Delhi, Chandigarh and other neighbouring states to Dharamsala and Chamba. From Chamba, we will arrange all the transportation. By evening drive to Dharamshala by AC Volvo coach. Overnight journey. Arrival at Dharamshala by morning time, here meets our executive and transfer to hotel, check in. Morning time is free; you can go for some independent activities or relax. After having lunch we will proceed for seeing the sights. 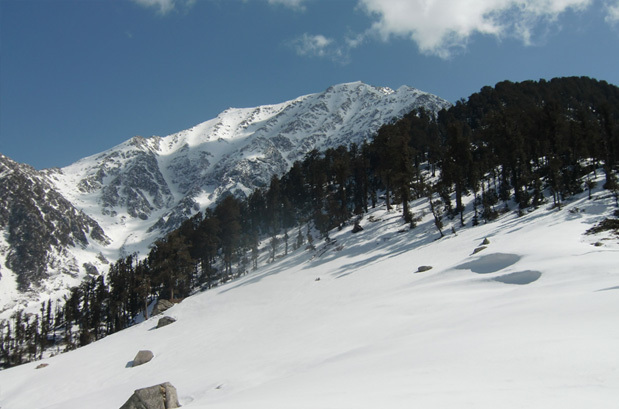 Dharamsala is a magnificent hill station that is divided into Upper & Lower towns and the here the altitude varies from the height of 1250 metres to 2000 metres. Dharamsala is additionally the seat of His Holiness Dalai Lama and his Government in exile. Mecleod Ganj located at (1730 meters) in the upper Dharamsala is well-known as the "Little Lhasa of India". We will stay in a hotel for overnight. In the morning we will drive for about (270 kilometres) to reach Chamba (1900 metres). Chamba is the westernmost region of Himachal Pradesh. The Chenab River runs in the north direction and the Ravi River in the south direction. In the middle of the town there is a large playground called the 'Chowgan', a verdant field of about 73 metres in width and 805 metres in length. Chamba has various fabulously carved temples. Overnight stay arranged at the Tourist Bungalow. Today we will leave in the morning and drive to reach Traila (2500 metres) by covering about 145 kilometres in around 4 hours. From Chamba you will enter the Pangi valley which is a land of the beautiful dances, pretty faces, and picturesque splendour. Mainly two communities, specifically Bhots and Pangwala reside in this valley. Reach the destination and overnight stay is arranged at the Tourist Bungalow. Today we will commence first trek to Satrundi (2900 metres) by covering approx 15 kilometres passing through a small village Bhanodi. The trek passes all the way through the forest pathway with gradual ups and downs up to Satrundi. Arrive at Satrundi and we will stay in the tents for overnight. Today we will trek to reach Bindrabani (2750 metres) and will cross Sach Pass (4500 metres) a steep climb from Satrundi. The pass offers fabulous views of the towering mountains, hanging glaciers and numerous virgin peaks. We will cross the glacier to reach at Bindrabani. We will set up camp and stay here for overnight. On this day we will begin the trek towards Killar (2400 meters) that is situated in the midst of criss-cross trails in a narrow and deep gorge of the Chenab River. We will stay in the tented camps for overnight in the peaceful surrounds. Today we will begin trek in the morning and head towards Purthi (2200 metres) by covering almost 24 kilometres in about 7 hours. After covering nearly about 7 kilometres, the trail turns towards east direction for Purthi. Purthi is a very spectacular place known for the best forest nurseries and the historical Rest House situated on the right bank of the Chandra Bhaga. Overnight stay arranged in the tents at Purthi. On this day, we will start the trek in the morning to reach Raoli (2000 M) in the trail we will be covering approximately 14 kilometres in around 5 hours. The trail is simple and has moderate ups and downs on the pathway. We will cross the River Chandra Bhaga through a rope bridge. On reaching Raoli, overnight stay is arranged in the tents. In the early morning we will drive to reach Manali (1920 metres) passing through Keylong covering about 240 kilometres in 6 hours. We will have lunch on the way. Overnight stay is arranged in the hotel at Manali. Today we will travel around Manali and in the afternoon transfer to Volvo stand, from here catch bus for Delhi. Overnight journey. When to book Sach Pass Trek? 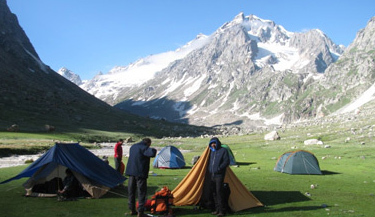 You should book Sach Pass Trek two months in advance so that you get ample amount of time to prepare well for the trek. Our pick up and drop point for Sach Pass Trek is Delhi (Janpath/RK Ashram Metro Station/Majnu Ka Tila). You can board Bus from these bus stops to Dharamshala. At Dharamshala our guide will pick you from bus station and then from there your tour will start. 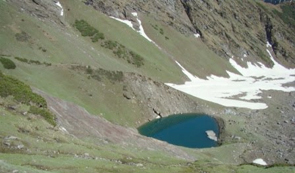 What is minimum age required for Sach Pass Trek? 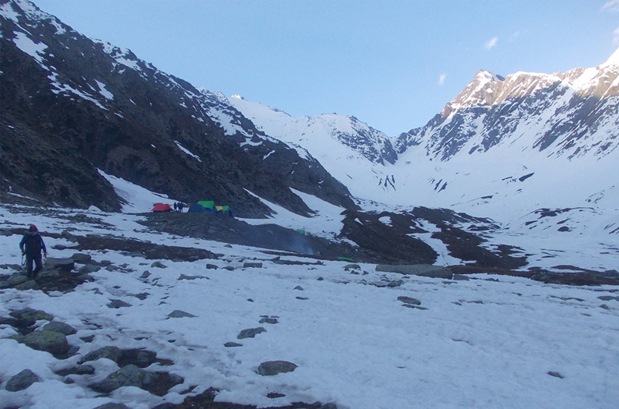 Sach Pass Trek is a moderate trek with a maximum altitude of 14925ft (4550m) minimum age required is 15 years. 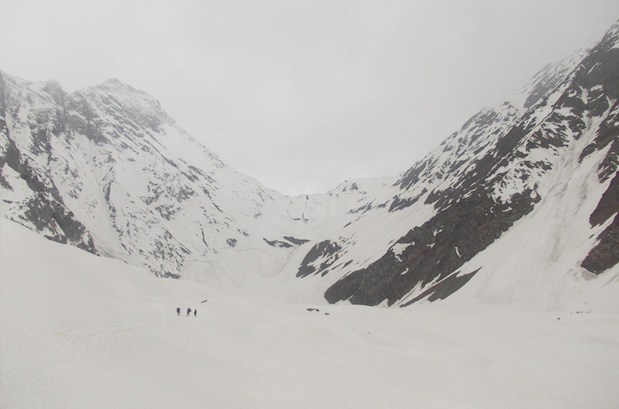 What will be the minimum temperature during Sach Pass Trek? In the montIn the month of July & August the temperature during the trek can go as low as 8 Degree Celsius during the night and it can rain heavily which will further decrease the temperature. 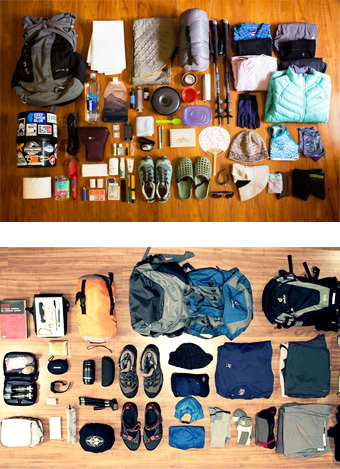 How long we trek during Sach Pass Trek?